(Text automatically translated) Rustic house in the heart of a medieval village, completely renovated (ceilings with wooden beams, terracotta floors and wooden floors) with all comforts and furnished in style. Equipped with a small private garden shaded by fruit trees. Very tranquillo.La house has two bedrooms and a study with the possibility of adding a fifth bed. Opportunity to enjoy a wonderful swimming pool in a Relais just a few meters away for 10 Euros per day including bibita.Gli of guests will be welcomed with a bottle of locally produced wine. The owners did everything to make this property a pleasure to stay at. It is full of character, yet comfortable and clean. With the modern bathrooms, dishwasher, clothes washer and air conditioning this apartment is an excellent value. The location is great as well - you can travel in various directions and see the sights in the Chianti region, Casentino or Umbria. Very comfortable and nicely appointed; a truly wonderful place to stay. We found this to be a very well-maintained property which was conveniently located in the center of the area we wished to explore. The beds were very comfortable, the kitchen was well equipped and we especially appreciated access to the clothes washer which was located within the same building but required external access. As all rooms are located on a second floor, if there are mobility issues it is important to note that one must use a wide staircase to get up and down to/from the main door which is at street level. Communication with the owner was swift and always extremely helpful and courteous. We also took full advantage of the fig trees around the property which supplied us with fresh figs every day during our stay. We would certainly stay here again and have absolutely no hesitation in highly recommending this property as a wonderful place to stay in this area. Doug and Joan B, Canada. This fascinating old house has been sympathetically restored with many original features and interesting old furniture which adds to the charm of the property. It has all the modern amenities for an enjoyable holiday including 2 excellent bathrooms, dishwasher and air conditioning. We enjoyed the sunny balcony and pretty garden and appreciated having a supermarket and excellent Restaurant/ Pizzeria within walking distance. The house was spotless and well equipped and we received a warm welcome from Gloria who kept in touch during our 2 week stay to make sure that all was well. The location was ideal for touring and visited a number of fascinating places including Firenze, Sienna, Assisi, Montepulciano and Chianti. 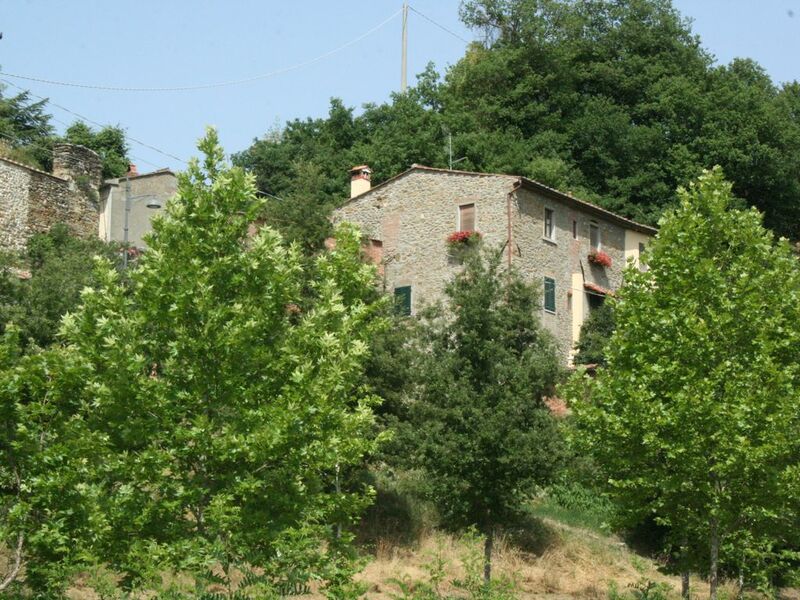 We felt the house was excellent value for money and would highly recommend it as a base for visiting Tuscany and Umbria. Thank you vary much for your valuable review. We hope to see you again in Arezzo. You are always welcome. Our family had a wonderful time during our week long stay at this charming apartment in the heart of Tuscany. The arpartment is a quaint, antique home in the small village of Castellucio, although the interior has been updated and it is quite cozy. The area around the village is beautiful. I started many of my mornings taking 5-8 km runs on roads that ran through grape vine, olive groves and farm fields along the Arno. The location of the apartment was a spectacular launching point for trips to cities in Tuscany and vineyards in Chianti. We took daytrips into Arezzo, Poppi, Cortona, Laverna and the beautiful forests in the nearby hills & mountains. The owners of the apartment were helpful and kind. We will definitely be visiting again in the future! NON FUMARE ALL'INTERNO DELL'ABITAZIONE ,LA CONNESSIONE INTERNET E' ATTRAVERSO UN ROUTER MOBILE.